Garurumon X is an altered version of Garurumon that carries the X-Antibody Factor : Garurumon in its Digicore. Its rare fur has hardened further from living in colder places, making it difficult to hurt. 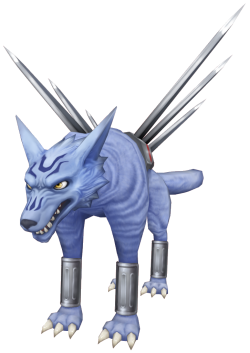 Its fighting instinct has become even more intense, driving it to fight to the bitter end, so Garurumon has few Digimon that are willing to fight against it. As it boasts the best qualities of a Combat-species Digimon, it is said that a qualified Tamer is required to handle it. Freeze Fang. Ice attribute 3 seconds cooldown 18 DS consumed 2 skill points per upgrade Learned at Lv. Freezes the part where the attack has hit. Fox Fire. Ice attribute 9 seconds cooldown 64 DS consumed 3 skill points per upgrade Learned at Lv. Exhale breath of blue blaze from its mouth. This page was last modified on 21 April 2019, at 22:31.